Rhinoplasty, commonly known as a nose job , is a plastic surgery procedure for correcting and reconstructing the form, restoring the functions, and aesthetically enhancing the nose by resolving nasal trauma (blunt, penetrating, blast), congenital defect, respiratory impediment, or a failed primary rhinoplasty. Most patients ask to remove a bump, narrow nostril width, change the angle between the nose and the mouth, as well as correct injuries, birth defects, or other problems that affect breathing, such as a deviated nasal septum or a sinus condition. Primary Rhinoplasty refers to the fact that the patient has not undergone any nose surgery before, and it is his first Rhinoplasty. Primary Rhinoplasty can be performed both to correct the shape of the nose and treat breathing problems due to structural problems. In primary Rhinoplasty, excess bone and cartilage are removed from beneath the skin that covers the nose. Cartilage grafts may also be added to help remodel the nose. Primary Rhinoplasty may take one to two hours. 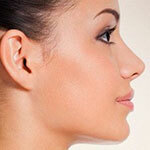 The main purpose of secondary or revision Rhinoplasty is to fix the results of previous unsuccessful Rhinoplasty(s). However, it is highly recommended that you should wait at least a year after the first Rhinoplasty so that all swelling subsides. Secondary Rhinoplasty can also be done to repair functional issues, like difficulty breathing. Most probably, cartilage may be added or taken away during the surgery to recreate symmetry. The whole procedure may take up to four hours. A rhino plastic correction can be performed on a person who is under sedation, under general anesthesia, or under local anaesthesia; initially, a local anaesthetic mixture of lidocaine and epinephrine is injected to numb the area, and temporarily reduce vascularity, thereby limiting any bleeding. Generally, the plastic surgeon first separates the nasal skin and the soft tissues from the Osseo–cartilagenous nasal framework, and then corrects (reshapes) them as required, afterwards, sutures the incisions, and then applies either an external or an internal stent, and tape, to immobilize the newly reconstructed nose, and so facilitate the healing of the surgical cuts. When the rhinoplasty requires a bone graft, it is harvested from either the cranium, the hips, or the rib cage; moreover, when neither type of autologous graft is available, a synthetic graft (nasal implant) is used to augment the nasal bridge.